12th JANUARY promises to be a red-letter day for racing at Fannie Bay when the long-awaited new raceday tie-up stalls will be used for the first time. 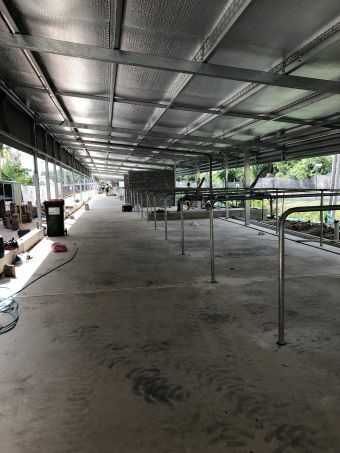 The $1.3m project, which has been many months in the planning, will finally be unveiled at the first meeting of 2019 and promises to provide levels of comfort for participants, both equine and human, never seen before on racedays in Darwin. Since the construction of the tie-ups began in late September, some nine meetings have been conducted, with horses stabled in the Visiting Trainers Stables adjacent to the back straight at Fannie Bay on racedays. And with just the 29th December meeting to go, everyone is eagerly anticipating being in the new facility from the New Year. The 72 tie-up stalls (an increase of nine on the previous set) feature a roof area of 1200m2, more than double that of the old tie-ups. 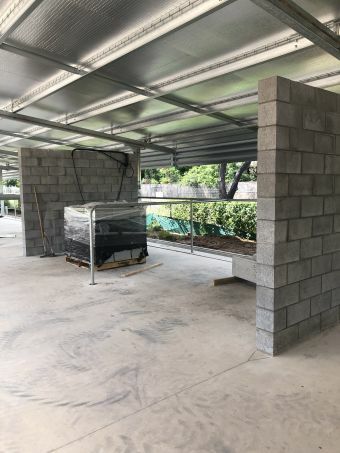 This means that not only will the horses be protected from all weathers, but the trainers and their staff will also be totally under cover, which will be such an advantage in the often harsh conditions experienced in the Top End. The stalls feature a fully insulated roof, which will significantly reduce the temperature in the tie-ups, close on 100 fans (situated under cover, at both the front and rear of the tie-ups), Polvin security fencing, three wash bays (two bays in each) and specialised equine rubber flooring which has been such a success in the mounting yard. There will also be a plethora of taps to allow easy access to water for trainers, strappers and horses. Kevin Clarke and his team from Clarke Constructions are to be congratulated on the mammoth job they have undertaken – the civil works alone provided a number of headaches along the way before even the concrete could be poured – and DTC Board members Damien Moriarty and Dale Bicheno, along with DTC CEO Keith Stacy, have been ever-present on a daily basis in overseeing the development of the new facility. There can be no doubt that the participants will be counting the days until the 12th January meeting – it will certainly be a momentous day for Top End racing, and a facility that the industry can be truly proud of.